Dating in the modern world can be seriously difficult. We've got so many apps and options that sometimes finding an activity is more difficult than landing the date itself. One would think that a creative approach towards making a plan would be appreciated. One would be wrong. London resident Ben Velzian learned this the hard way. After his prospective date asked for suggestions, the ambitious Velzian responded by creating a full Powerpoint of options, complete with pros and cons. Tom, his almost-date, promptly blocked him after receiving the oft-clever presentation. 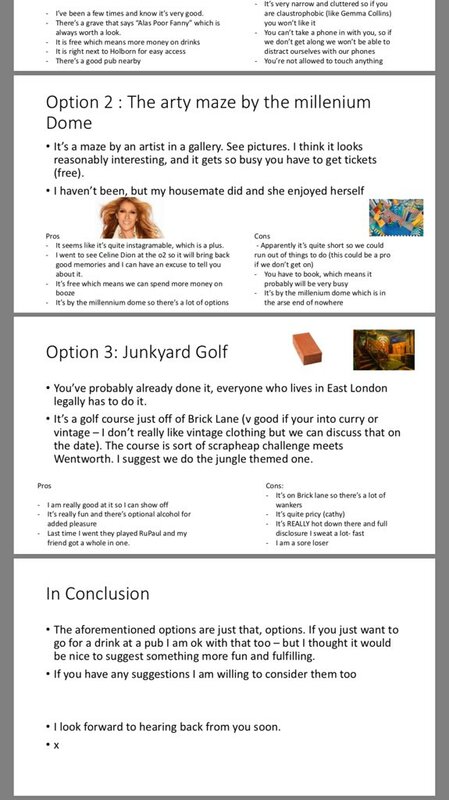 The full saga is below - do you think that a Powerpoint is too much effort for a first date? Or would you appreciate the gesture?